Three functions, one software: the PC-based Festo Automation Suite software combines the parameterisation, programming and maintenance of components in one program. It enables the entire drive package, from the mechanical system to the controller, to be commissioned in just a few intuitive steps. The free Festo Automation Suite is the main software of the constantly expanding Festo Automation Platform, entering the automation market with numerous new products and solutions from mechanical systems to the cloud. With this software, the parameterisation of servo drives and integration into the control program take no time at all. 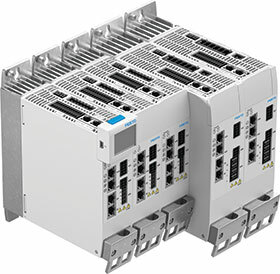 The software is an important part of the Festo philosophy of complete connectivity i.e. the ability to connect a workpiece completely to the cloud, from its mechanical connections and electrical interfaces to commissioning and controller programming. This simplifies the work of every machine builder and automation engineer when it comes to integrating the mechanical and electric technology, including the control levels and interfaces, with other hardware and software. The basic functionalities of all Festo components are included in advance. To customise the software, plug-ins or add-ons can be installed directly via the program. Just enter the equipment type or part number and the software will find and install the relevant modules. Device description data, manuals and application descriptions can be downloaded conveniently from the software without having to open a web browser every time. The overall control concept permits the problem-free commissioning of various devices. These are added to the product and connected to each other via drag and drop functionality. The plug-in of the servo drive CMMT-AS makes configuration and parameterisation child’s play, as the integrated commissioning assistant reliably and conveniently leads to a completely functional drive system in just five steps. Together with the automation system CPX-E, integration into the control system is quick and easy. Where 100 mouse clicks and keyboard operations were once required, only two now suffice. The software automatically integrates all required driver modules into the user program and calculates all important parameters in the background. Optionally, the Codesys add-on enables the further programming of motion control and robotics functions. Festo is driving digitalisation forward and helping its customers to enter the age of Industry 4.0. The company is combining its extensive knowledge of industrial applications with the latest developments in information technology to realise online applications for industrial automation practice. Festo is also using digital communication to support its customers throughout the Digital Customer Journey. This guides customers reliably and comprehensively through the Festo portfolio, from information procurement and configuration through ordering and delivery to commissioning and maintenance, and even to the technical training offerings of Festo Didactic.